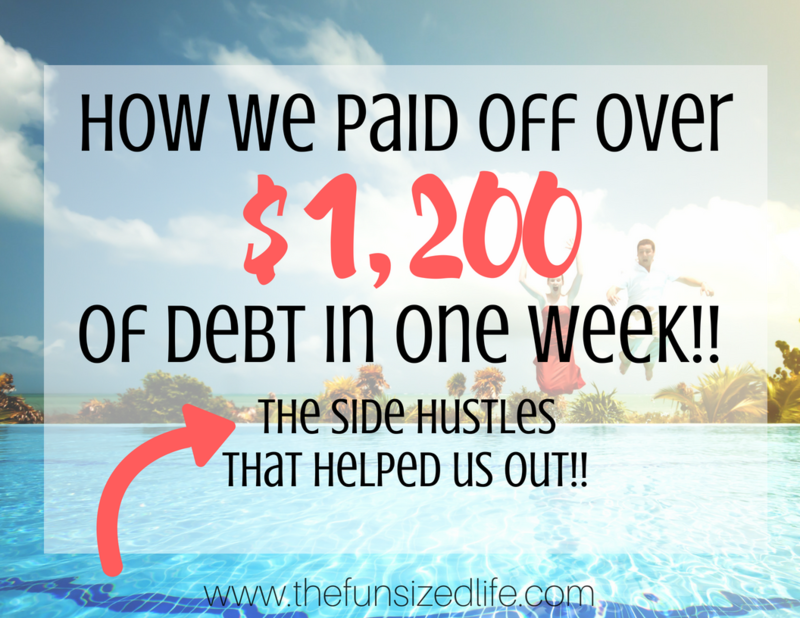 Side Hustles That Helped Us Pay Off $1,200 of Debt in One Week! Debt. Blah. I am so sick of it. It’s funny how when you start paying attention to something after years of ignoring it, it finds a way of working its way into your brain. After saving up $1,000 in a few weeks to help pay for our vow renewal, I started seeing how easy it was to money to pay off debt. While we have only been working on our final $10,000 of debt for a few months, we have been consistently paying it off (with a plan) for years. I am so ready to be done. I want financial freedom, I want a patio, I want to travel. Finally, I decided I’d had enough. In one week we paid off over $1,200 of debt and I want to tell about the side hustles that helped us do it! *This post contains affiliate links. While I may make a commission, all opinions are my own. It all started with the Debt Snowball. Tom and I had heard about the Debt Snowball for years and always thought it was too hard so we kept living with constant debt and no money. Typical. Our final $10,000 debt was originally a credit card that we had let get way out of hand. We continued making payments each month but our total never seemed to go down! I decided to look more into where my payments were going each month and it seemed like over half of our monthly payment was going toward interest! I felt like we would never escape this impossible pit of credit card debt. So, we decided to take out a loan with a lower interest rate. If you are in a similar situation, apply online for FREE for a lower interest rate and debt consolidation. If you are struggling with a high-interest credit card debt, this is something I strongly recommend looking into. Our monthly payments stayed about the same, but now most of our payment goes toward our principal balance rather than toward interest so our amount owed actually goes down each month! Finally, we can see the progress! With the Debt Snowball, we pay an additional $200 per month on top of our $264 monthly loan payment for a total of $464. This is our minimum payment. I have also been putting any additional funds that I can toward paying it off each month while also still repairing our cars, paying doctor bills and just trying to survive life! The blog has been a HUGE source of additional debt paying income for us. In fact, the best thing about living off one income is that we are able to put any money I make toward debt because it doesn’t have anywhere else to be. If you have ever considered starting a blog, make sure you take advantage of my 5 FREE lectures in my course, The Fun Sized Blogging Basics. The course is designed to break it down and get totally honest about exactly what it takes to run a successful blog. I show you my exact workload plus tell you all the best practices I’ve found to create a successful blog. Can you say, “BEST JOB EVER!? !” My aunt filled me in on the dog sitting site called Rover that connects dog owners with local dog sitters. I signed up for Rover and within 20 minutes I already had a request to dog-sit for an adorable Boston Terrier. We got to hang out with a Boston Terrier named Lola for 4 days and I actually made $100! If you are a dog lover like me, this is the perfect way to earn some extra cash! See my post on how to make more money with Rover. Apply for Rover totally free or get a $20 credit for your dog! This one right here is why I am so insanely excited about our debt payoff this week. Being a minimalist, I don’t have much trouble letting go of possessions. They mean very little to me…unless they were my grandmother’s. Because we hope to finish the basement someday we have hung onto our old couches, desk, and shelving in hopes that we could still use them once the basement is finished. The thing is, the basement will never be finished as long as we have this debt hanging over our heads. In the 2 years, we have lived in this house, our couches have maybe been used 5 times. Maybe. The desk hasn’t been touched and our shelves just collect more junk and dust. All of these things were standing in our way of getting out of debt and getting what we really want! I have known this for a while, but this month, I was finally able to get Tom to see my side of things! So, we started selling our stuff! Anything we don’t use on a regular basis was out the door. Facebook Marketplace – I love selling on Facebook Marketplace because you are reaching people in your area. This is ideal for big items like furniture. Decluttr – Decluttr is an awesome site that allows you to ship off all your items like DVDs, electronics, gaming systems and more and get paid for them right way! This is perfect if you don’t want to deal with the hassle of selling online or meeting up with people to make sales. Read my full Decluttr review. Half Priced Books – If you have a Half Priced Books or another used book store in your area, I strongly recommend giving them a try to make cash on your old books, games, and DVDs. This isn’t as easy as selling online but it’s definitely a close second! Amazon – Yes!!! You can sell on Amazon! In fact, some people earn a living this way! It’s also a great idea if you have items that you are hoping to sell because Amazon allows you a wider audience and they only charge a .99 cent fee for selling an item. Personally, I would recommend this for nicer electronics like phones, laptops or iPads. Learn more about selling with Amazon FBA. Another thing I did to earn some extra cash this month was doing photography for friends and family. I used to do photography full time, so people know and trust my work. This summer I decided to charge a simple $50 per photo session and it has been a great way to bring in some extra cash! Thanks for sharing all your tips! I’m a huge budgeting nerd! I hear ya Dianna! Never thought I would love numbers this much! Side hustles are key and can be fun too! Thanks for the tips! For sure! It feels so awesome to have found these different sources! Thanks Robert!